WANT TO LEARN some of the secrets behind preparing what is one of the world’s most loved cuisines? Answer yes to any of the above and you’ll want to make a reservation at the resort’s Oriental Culinary Academy, which runs Thai cooking classes daily (except Sunday). The Culinary Academy is located in a wooden pavilion behind Le Grand Lanna restaurant. Its classroom-style kitchen is fitted with individual cooking stations, extractor hoods, sinks and preparation areas for up to 20 “culinary students”. At the end of a class, guests are presented with an apron, Oriental Culinary Academy certificate (perfect for hanging on the kitchen wall back home) and easy-to-follow menu print-outs of the dishes cooked… great mementos from a great experience. There is an option to include in the Cooking Class a visit to the local wet market, where guests are guided through an intriguing maze of stalls selling fresh vegetables, fruit, meats, sweets and other exotic market produce. 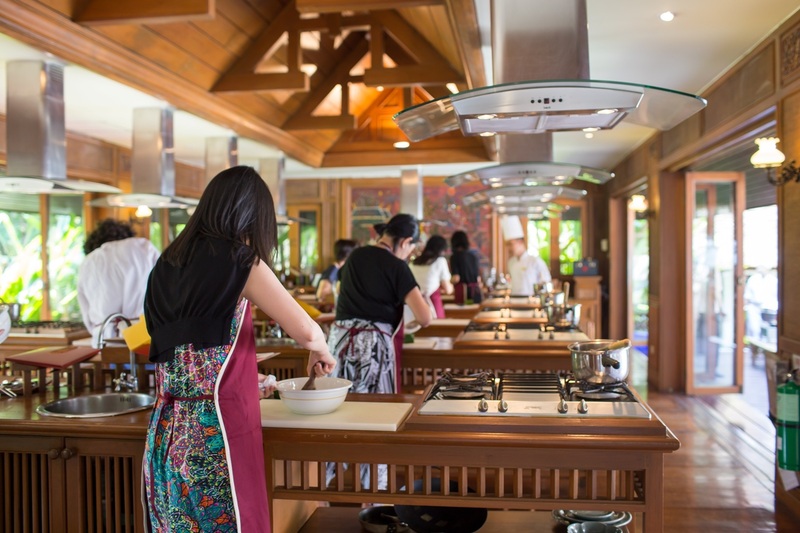 The Cooking Class with Market Tour is available once daily from 8 a.m. to 1 p.m, at 3,500 THB net per person.